I don’t normally eat a lot of bread but this town has some fantastic French bakeries. It is hard to resist fresh croissants in the morning, still warm from the oven. The chocolate ones are incredible as are the traditional type. 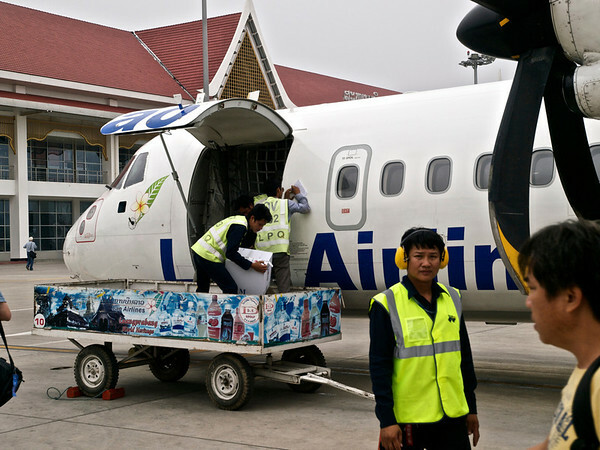 We arrived from Chiang Mai on Easter Sunday evening via a Lao Airlines twin prop. It was actually a smooth flight and we were immediately taken to our guesthouse where our Laotian hostess Manichan and her Belgian husband Peter warmly greeted us. Our private room is just off the courtyard where a great breakfast is served each morning. 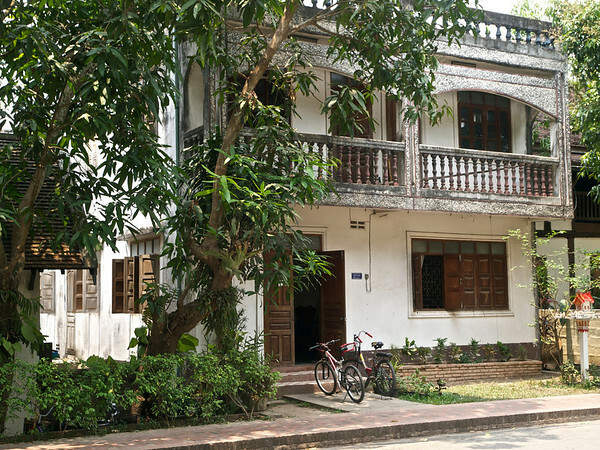 Manichan Guesthouse is located in the UNESCO World Heritage section of the city so it is an easy walk to the many Wats (33), French bakeries and great restaurants in the area. 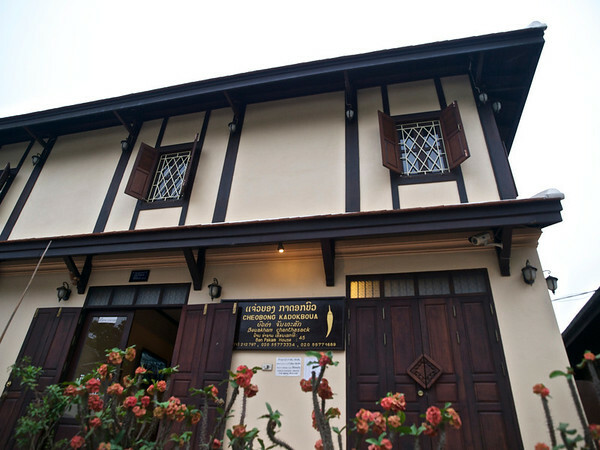 The architecture is a mix of traditional Lao wooden buildings and French Colonial style. 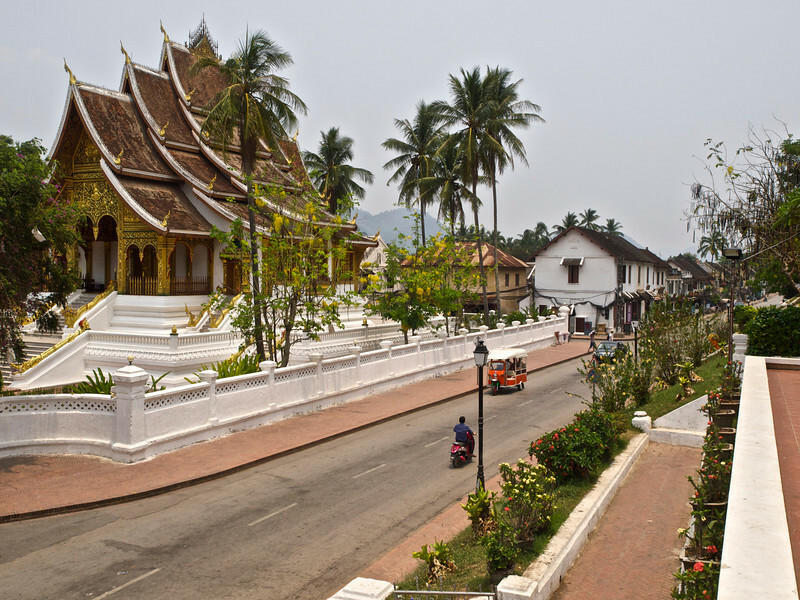 Perhaps due to the relative poverty of Laos following the secret American war and communist occupation in the 1960’s and 70’s, Luang Prabang escaped both communist and capitalist redevelopment long enough to be inscribed as a World Heritage Site. Sunday evening and Monday were spent walking everywhere. 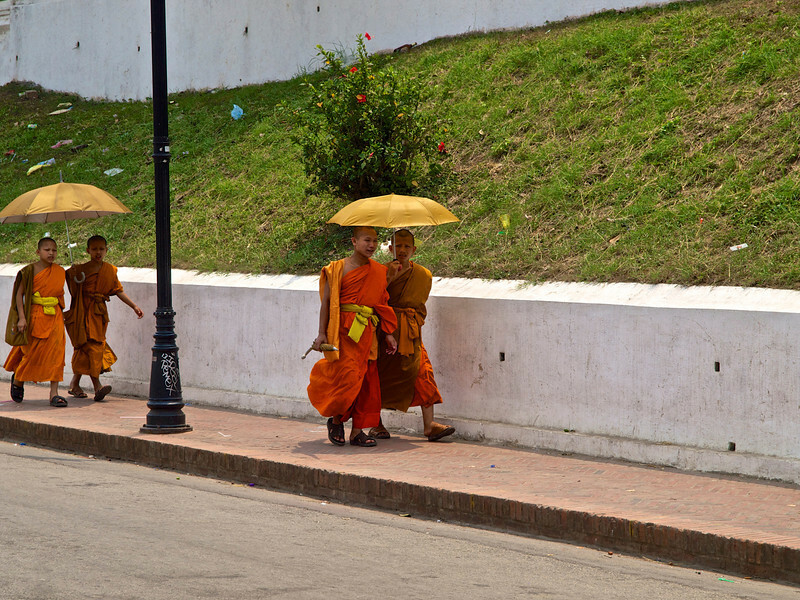 The old city is on a peninsula formed by the confluence of the Mekong and Khan Rivers. When it got too hot we would stop for an ice-cold soft drink or Beer Lao. Sunday evening we had an amazing dinner at Tam Nak Lao. For our first meal in Lao PDR, we had an incredible five course (four course set menu plus an order of green papaya salad) meal on the porch of an original Indochine French colonial house. Courses included Tom Yom (very spicy tomato based soup with prawns), fish laap (traditional Lao minced fish salad), sticky rice, Say Ua Moo (pork sausages with cucumbers and Luang Prabang chutney), and banana upside down cake. I think I was even more surprised by the French table service; after all, I just spent seven months in Thailand where you can sit at a table for three hours and they will never bus a single dish no matter how many pile up. Monday’s walking highlights included the National Museum, formerly the Royal Palace. Admission is 30,000 kip or about US$3.80. Shoes, handbags and camera are not allowed inside but they provide free lockers for safe storage. Note the museum is closed on Tuesdays. It also closes for lunch from 11:30-1:30 every day. Inside are beautiful furnishings, ceremonial swords and other artifacts and Buddhas, many several hundred years old. 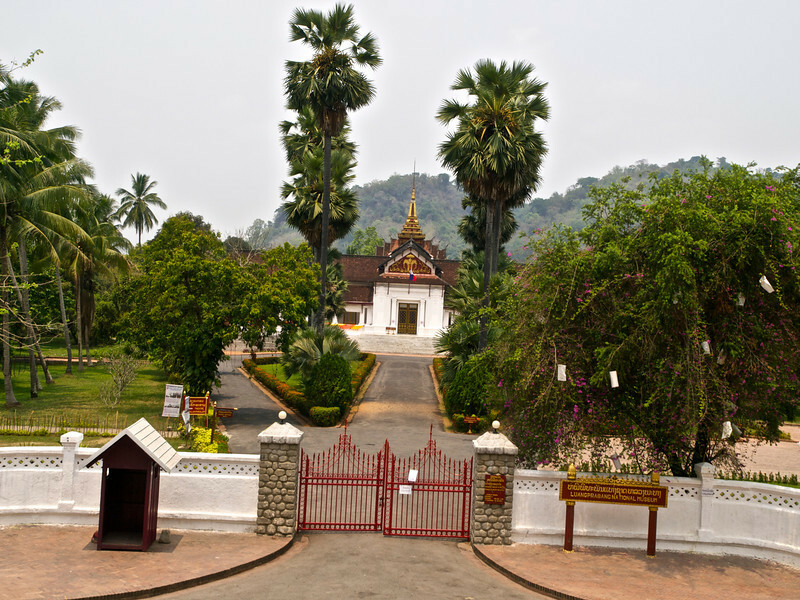 One gets a very good sense of what it was like when Luang Prabang was the center of a kingdom. I suggest walking around the grounds as well. They are quite pretty and palm-shaded. At the back of the grounds we stumbled upon the unadvertised royal garage which was open for visiting. Inside were many old Lincolns and a vintage Citroen. There was even an Edsel. The American cars were all gifts from the U.S. Government to the Royal family. Also on the grounds is the stunning Wat Haw Kham. It was closed but we returned later and it was open. Unfortunately, one is only allowed to look inside from the doorway but the detail work makes even that worthwhile. From 5:00-10:00 pm, the main street turns into the night market featuring many Hmong crafts in addition to the usual T-shirts and souvenirs. The next street over is the morning market from 5:00-10:00 am every morning. Come early for best selection. That is when you will see the locals doing their vegetable shopping. Walking along both rivers is recommended too. 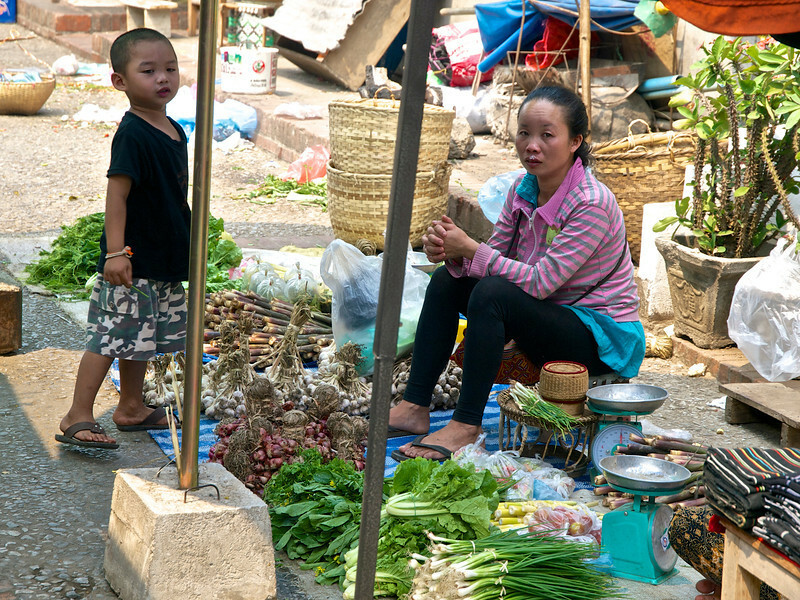 Along the Mekong are more street food type affairs. We were warned that hygiene is questionable and no one seemed to be frequenting them. Although we normally eat street food at almost every opportunity, we passed and instead enjoyed the many cafes, restaurants and bakeries that Luang Prabang has to offer. After all, how many places can you get a multi-course French dinner for around US$10 per person? 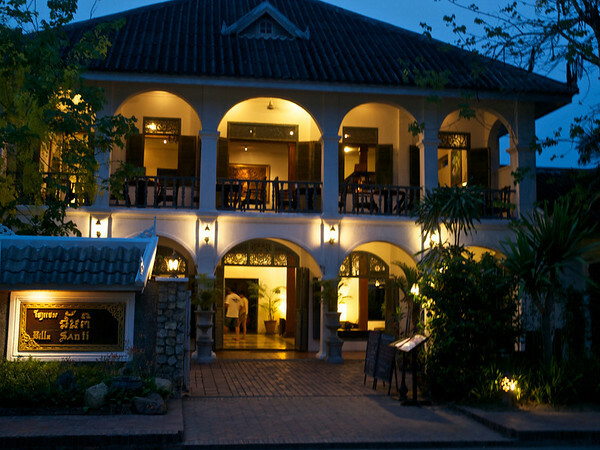 On the Nam Kahn River are may guesthouses, restaurants and bars, all with views of the river. 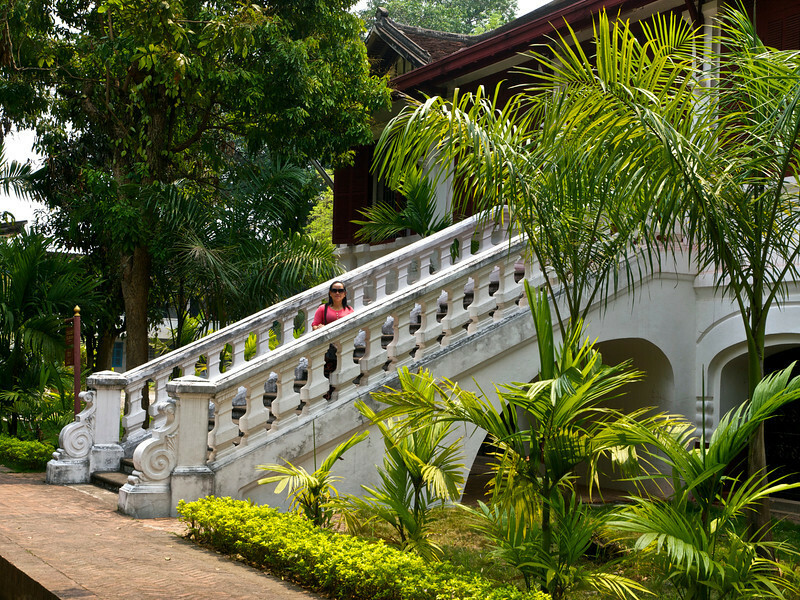 They are mostly French Colonial architecture with some Lao woodworking touches. It is easy to spend a few days walking around this beautiful World Heritage city. One more wonderful tour, I really love the way you put these together.